G90 Absolute Dimensions or Absolute Programming is Modal G-code. 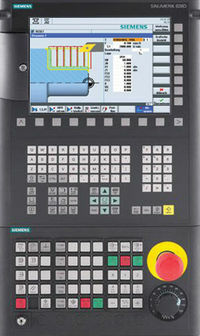 Siemens Sinumerik provides AC (non-modal absolute dimensions) command to access individual axis absolute position. Read full article Sinumerik Absolute Dimensions G90 Modal and AC Non-modal Command. With Absolute dimensions or Absolute programming, the programmed position always refer to the zero point of the currently valid coordinate system (workpiece-zero-point). 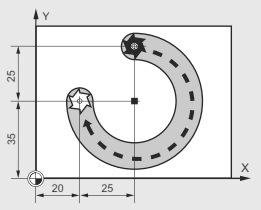 ; circular interpolation, circle center point in absolute dimensions. As Non-modal absolute dimensions (AC) are possible for spindle positioning (SPOS, SPOSA) and interpolation parameters (I, J, K). So this program use AC non-modal absolute dimensions command to access circle center point dimensions.